A Group of Passionate Yet Light-hearted Followers of The Great Detective, Pledged to Promote the Sacred Texts and Have A Laugh, Whilst Skirting Dangerously Close to Pomposity. Our first gathering at the wonderful Art Club in Bath Street, courtesy of member Jeannie Rae. Holmes and Watson would have approved of the darkwood library setting, and the excellent fizz brought along by the generous Louise Murray, who had wisely decided to give priority to a Sherlock Holmes Society meeting a few days before her wedding. Also struggling through the snow were Noelle Carroll, Jeannie and Allan Rae, Simone Hughes, Andy Lombardini, Paul, Scott Stevenson and Barry Young. Ann Dickson was a very welcome new face, and we had apologies from Elaine, Graham and Sharon as well as good wishes from many others who couldn't make it. It was agreed that an annual subscription of £10 would be levied on all members, of which more in another posting. We also agreed that, as the Self-Important Scotland Yarders, it was incumbent upon us to adorn ourselves with as many honorifics and titles as possible. Therefore, in homage to Dr Grimesby Roylott in The Speckled Band, the Chairman will be known as the Scotland Yard Jack-in-Office, the Membership Secretary will be addressed as The Busybody, and the Treasurer as The Meddler. Barry Young was anointed to the first position, with Dr Allan Rae filling the shoes of The Busybody, and Simone Hughes taking on the mantle of The Meddler. Next meeting in the Art Club on January 31st at 7.30pm, when we're discussing A Scandal In Bohemia and Sharon Mail will be giving us a talk on her friend and subject of her book We Could Possibly Comment: Ian Richardson Remembered. The great Shakespearian actor played Holmes in two TV specials and also Dr Joseph Bell in the BBC Murder Rooms series. Further to my earlier post about the good wishes we've received from Holmesian Societies around the world, we've had further communication from the Crew of the SS May Day in Belfast who like our new name; the Unscrupulous Rascals of South Australia, who sent a whole load of journals, leaflets and information about their society as well as their good wishes, and notes of goodwill from the Deutsche Sherlock Holmes Gesellschaft and German resident and renowned Doylean author Paul Spiring. Another interview about the Self-Important Scotland Yarders this morning, standing at the very heart of the great metropilos - up to our knees in slush in Baker Street, Shawlands. New technological advances meant we couldn't do the interview in the shop, as Richard had to point his wee dish at the sky, so we ended up in the nearest canonical location. In attendance - Allan and Jennie Rae, Scott Stevenson, Noelle Carroll, Andy Lombardini, Louise Murray, Simone Hughes, Barry Young, Elaine Mcleary, Graham Walker, Sharon Mail, Paul, Douglas Murray and Mark Burns. Another excellent meeting in The Boswell Hotel. A Study in Scarlet was the topic - the first Holmes story for our first official meeting. A lot of the discussion focussed on the unusual structure of the novel, particularly the change, from major to minor, in the middle when Holmes and Watson give way to an American melodrama. Did Conan Doyle know the impact his creatuon would have? Did he envisage Holmes as a regular character in a series of stories? How fixed were the personalities of Watson and Holmes from the first meeting? Some of the members liked the central part of the story, others found it too much of a jarring change of pace. It was unanimously agreed that Holmes was an extraordinarily complete character to emerge in a single story, and as a fully formed Consulting Detective with his faithful amanuensis was a triumph of the writer's art. The influences on Doyle, from Edgar Allan Poe to Margaret Oliphant, were discussed, and there was an exchange of views on whether A Study in Scarlet was an appropriate choice for the first Holmes story to be read by a newcomer to the Canon. Some members thought the strength of the London scenes and particularly the wonderful introduction scene made the book an obvious starting point - others felt the disjointed nature of the American scenes and the untypical nature of the novel made it more appropriate for later study, perhaps after the Adventures. There was a practical demonstration of the unlikelihood of imobilising a man with a towel tied round his ankles, and much more general talk on Holmes and his world. The fatal combination of being very busy, very tired and very lazy has meant a near-unforgiveable delay in posting on this blog. If there's still anybody out there, sorry, and I promise to be more regular in the future. The last meeting in the Boswell was another great success, with a near perfect turn-out by previous attendees, plus a few more new faces. I'll be posting more details about that meeting in a day or two. One of the main points to be discussed was a canonical name for the society. Many suggestions were made, from the St Simon Parallels to the Scotchwoman's Breakfasts. None really hit the mark, until The Self-Important Fools - a reference from the Illustrious Client - was mentioned. There was also a groundswell of support for Scotland Yard to be included, as the most obvious Caledonian reference in the canon. Eventually, and after much discussion, argument, counter-argument and hissy fits -particularly from the chairman - The Self Important Scotland Yarders was settled upon. 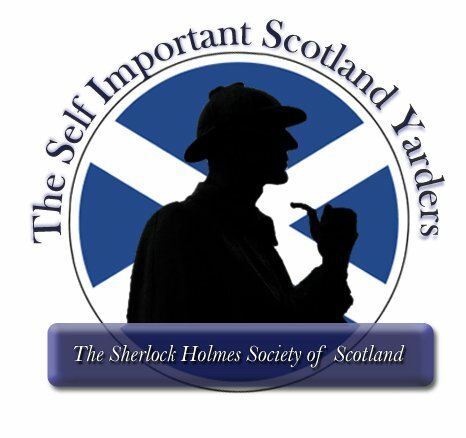 The Sherlock Holmes Society of Scotland will be retained as a subsidiary title. (now in storage until the tramworks are finished around Leith Walk), and the font is Baskerville, a beautiful typeface designed by John Baskerville in 1757. On the eve of our first official meeting, news from around the globe of Holmesian greetings from fellow Societies. Thierry Saint-Joanis, président de la Société Sherlock Holmes de France, BSI, (wearing the kilt in the top picture and with Alexis Barquin, webmaster of www.sshf.com & http://www.sh-whoswho.com/ in the second) has said "bienvenue en Holmésie". "We hope to meet you very soon somewhere in our country (Scotland or France) to sign our "Alliance" (the Sherlock Auld Alliance). Bravo et à bientôt!" The Unscrupulous Rascals, the Sherlock Holmes Society of South Australia and their "phantom" sister society The Very Finished Types (which comes from a reference in the Disappearance of Lady Frances Carfax) have also welcomed us into the extraordinarily friendly world of Sherlockdom..Canonical Greetings and warm congratulations on establishing your society for the appreciation of Sherlock Holmes in the nation of birth of his genius inventor and author. Not before time after all. Well done That's from Dr Ross Philpot of that society, who is known by the Canonical name Dr Leslie Armstrong (from The Missing Three-Quarter). We've also had messages of support and welcome from the Norwegian Explorers of Minneapolis, whose Karen Murdock has been in regular contact with some of her excellent writings on Holmes for various publications, which she rightly thought would be of help to me, and we’ve also had congratulatory messages from the Hounds of the Internet, one of whose contributors noted “actually, the first Sherlock Holmes Society in Scotland was The Dancing Men of Edzell founded in 1987. However, she seems to recall that this was founded by an American at an American military base and it may not have spread out into the community or lasted very long. Another correspondent on the site noted: "A prophet is not without honour, save in his own country, and in his own house. Matthew 13:57". Due to an arid imagination and a lack of confirmation regarding a city centre venue, it has been decreed that the Boswell Hotel will once again be the meeting place for the fledgling society. Our first official get-together will be at 7.30pm on Monday, October 25th at the hotel in Mansionhouse Road, Glasgow G41 3DN. There have been quite a few inquiries since the inaugural meeting, mainly through the bookshop and by email at sherlockscotland@btinternet.com, and I'm hoping there will be a smattering of fresh, eager faces when we next meet. A Study in Scarlet is up for discussion, but no doubt there will be room for many more topics. Come one and all, bring an inquiring mind and a few pennies for a beer, and a good evening should be had by all. Welcome to Scotland's Sherlock Holmes Society! Founded as long ago as September 2010, the Sherlock Holmes Society of Scotland meets once a month to talk about Holmesian things, surprise each other with strange anecdotes, and have a drink. We are a very mixed bunch of people from all backgrounds and with all depths of knowledge about The Sacred Writings. The Holmes canon attracts interesting people, so please come along - you'll be very welcome.